UCLA researchers have provided the first description of the structure of the herpes virus associated with Kaposi’s sarcoma, a type of cancer. The discovery answers important questions about how the virus spreads and provides a potential roadmap for the development of antiviral drugs to combat both that virus and the more common Epstein-Barr virus, which is present in more than 90 percent of the adult population and is believed to have a nearly identical structure. In the study, published in the journal Nature, the UCLA team showed in the laboratory that an inhibitor could be developed to break down the herpes virus. Kaposi’s sarcoma-associated herpes virus, or KSHV, is one of two viruses known to cause cancer in humans. There are eight types of human herpes viruses, and they cause a wide spectrum of diseases, ranging from common cold sores to cancer. Most people carry one or more of the viruses. The herpes virus typically does not cause major health problems until the immune system is compromised — after an organ transplant, by AIDS or another disease that affects the immune system, or in older age. KSHV was discovered in the mid-1990s at the height of the AIDS epidemic, when as many as half of people with AIDS were found to have the virus; it continues to be the most common cancer-causing virus associated with AIDS. In low-income countries, KSHV also poses a significant threat to people who don’t have AIDS. In sub-Saharan Africa, for example, approximately 40 percent carry the virus, and Kaposi’s sarcoma is among the most common cancers in the region. No vaccine or drug has been developed to prevent or treat KSHV or the cancer it causes; nor has a vaccine or treatment been developed for Epstein-Barr, another member of the herpes virus family and one of the most common viruses in humans. Epstein-Barr is best known for causing infectious mononucleosis, but it is also associated with an increased risk for several cancers, as well as a rare type of head and neck cancer called nasopharyngeal carcinoma. 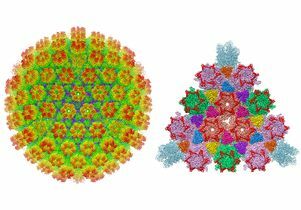 Knowing the atomic structure of the herpes virus’s protein shell, or capsid, could be an important step toward antiviral therapies. It would give scientists specific targets in the protein shell that are critical to the virus’ ability to spread. The UCLA researchers used a new electron-counting technology called cryo-electron microscopy, whose inventors won the 2017 Nobel Prize in chemistry. The technology enabled the scientists to see the herpes virus with unprecedented resolution, which in turn allowed them to create a 3-D atomic model of the virus. The virus is composed of approximately 3,000 proteins, each consisting of roughly 1,000 amino acids. Sun’s group is following up on these findings by screening for drugs that could perform similar antiviral actions in humans. The study’s other authors are Xinghong Dai, Danyang Gong Hanyoung Lim, Jonathan Jih and Ting-Ting Wu, all of UCLA.